The Anza group at the University of California San Diego operates a broadband seismograph network consisting of 17 three component broadband seismograph stations centered near Anza, California (see map). On Tuesday February 26 2013 at 12:18 PM (PST) we recorded an earthquake (preliminary M 3.6) located near Loma Linda and along the San Jacinto Fault. If you have felt this quake, the USGS would like to know. Please add your comments to the USGS page "Did you feel it?". View the most recent map of local events near San Diego or a slightly wider regional view of events recorded by ANZA, or a map of events recorded by ANZA from around the globe. Initial source parameters for this tremor are indicated below. The epicentral distance (i.e. the distance separating the epicenter and the closest station in the recording network) for Anza is 11 km (0.10 degrees). This map shows the mainshock as a red star. Associated aftershocks are orange stars. Anza network stations are yellow triangles. Blue lines are major rivers. Thin black lines are state boundaries and thick black lines are national boundaries. * The location and magnitude determined for this event are preliminary and are subject to change upon further review of seismic data. We operate a broadband station at the Santa Margarita Ecological Reserve. At 12:18 (PST) station SMER recorded the P wave from this event. Here is a view of that event as picked by our analyst. A red P indicates a P wave arrival, a red S indicates an S wave arrival. 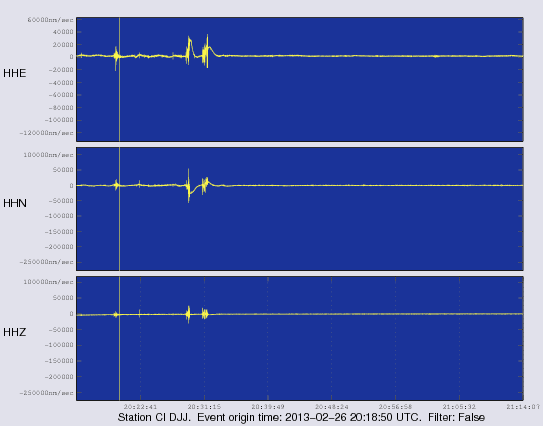 View a larger image showing the waveforms recorded at the Santa Margarita Ecological Reserve. 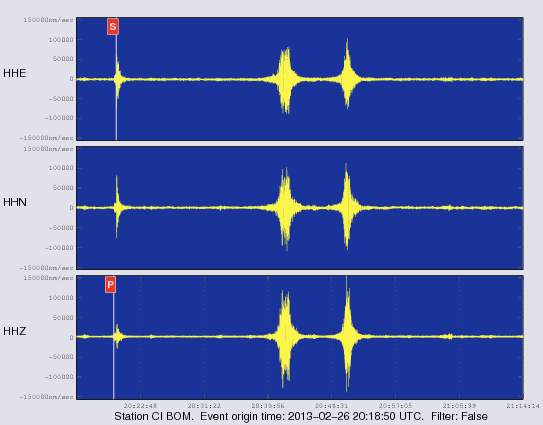 Visit the IRIS website with additional links to seismic data for this event. Los Angeles Times: "3.6 magnitude earthquake shakes Inland Empire"
Learn more about the Anza group (including who works here, other networks, nuclear tests in China/India/Pakistan). Learn more about the ANZA network (includes more station information, research, etc). Copyright © 1989 - 2019. All Rights Reserved.